At first they looked like white birds skimming across the ocean surface before diving into the restless water. But we were in mid-Atlantic, far from shore, sailing on an ultra-luxury cruise ship from Barbados to Cape Verde, off the coast of West Africa. 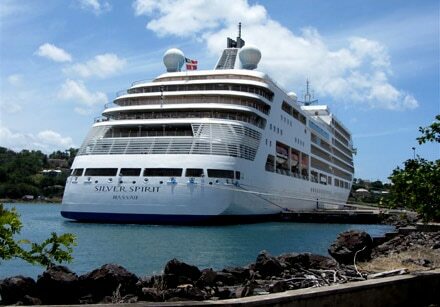 The ship was Silver Spirit, the largest and newest in the Silversea Cruises fleet. The sea creatures turned out to be flying fish, which surface in abundance in this area of the South Atlantic. The schools of flying fish were just one of the many delights of this repositioning cruise, a twice-a-year ritual for many cruise ships as they move from their winter itineraries in the Caribbean and South America to summer destinations in Europe and the Mediterranean. Surprisingly, the Silver Spirit had only 240 passengers, about half the normal total, served by 370 well-trained and gracious staff. This was our fourth trans-Atlantic cruise and, like the other lucky passengers, we love the extended time at sea, the gentle daily blend of ship and ocean and the huge selection of activities available. In particular, ocean crossings offer an array of talented guest speakers who entertain and inform in a series of lectures. On this cruise the daily talks in the spacious main theatre were by a biologist/oceanographer, a retired British ambassador and a forensic pathologist. Every evening the main theatre was open for a performance by the six resident singers (the ABBA night was particularly memorable) or a variety of excellent vaudeville acts. The bars and lounges also had live entertainment. This cruise also had a culinary theme and most mornings at sea featured food demonstrations and tastings ranging from Normandy-style Dover sole to moist chocolate cake with raspberry coulis. In the afternoons, an elegant tea was offered with twelve kinds of Ronnefeldt loose organic tea served with finger sandwiches, scones and pastries accompanied by live music. The crossing was exceptionally smooth and many guests spent their days on comfortable deck chairs around the pool or in the large library where the fine selection of books was augmented by daily satellite editions of major newspapers from the US, Canada, Britain and Australia. Excellent coffee, tea or complimentary cocktails were always available from the attentive staff. The large, well-equipped staterooms, each with a well-trained butler to meet every need, are key reasons why, according to Hotel Director Paolo Percivale, more than 50 per cent of Silversea passengers are repeat guests. All suites have comfortable beds (queen or twin), plenty of storage space, a well-stocked complimentary bar, lots of mirrors and marble bathrooms with tubs, showers and high-end toiletries, and flat screen TVs. Almost all suites have a spacious balcony. Silver Spirit also offers 26 double-size Silver Suites, with separate powder and living rooms, a huge walk-in closet and a Bang & Olufsen audio system. Leisurely dining is one of the great pleasures of cruising and Silversea consistently showed us that small ships can be especially creative at mealtime. Its formal partnership with Grands Chefs Relais & Châteaux brings a level of sophisticated cuisine that ranks among the best we've ever enjoyed. The main, single-level dining room offers open seating and contemporary international fare with an excellent selection of complimentary wines. Silversea purchases fresh fish and produce in the various ports it visits and we benefited with delectable fresh seafood from Barbados, St. Lucia, Cape Verde, the Canary Islands and Morocco. Remarkably, Silver Spirit also offered five other restaurants at mealtime and we got a chance to sample them all. La Terrazza is the spot for breakfast and lunch buffets. A separate room for dining (including the spacious back deck) and a well-planned food area meant no crowding and lots of time to choose among the huge variety of salads, main courses and desserts. In the evening La Terrazza becomes a fine Italian restaurant that follows the principles of Slow Food. The upper level of the Pool Grill (casual fare and pizza at lunchtime) turns into the Black Rock Grill in the evening when waiters bring a pre-heated volcanic flat rock to your table and let you cook your steak or seafood exactly as you like it. The extra-cost Seishin restaurant is an intimate dining area featuring Asian fusion cuisine and Kobe beef while the formal Le Champagne (also extra cost) is the only Wine Restaurant by Relais & Châteaux at sea. Here, an exquisite six-course menu is featured with perfect wine pairings. Our favorite dining experience on Silver Spirit was the Stars Supper Club. The Art Deco-inspired design is perfect for the chef's fixed menu of fifteen small but creative dishes served three at a time over five delicious courses. Among the offerings were lamb noisette with pancetta and Thai prawn with birds eye chili. To add to the atmosphere of a 1930s style supper club, a talented singer of light jazz, accompanied by piano, serenades diners and dancers throughout the evening. After five tranquil days, it was exciting to land at Porto Novo, Cape Verde, the westernmost municipality in all of Africa. Porto Novo (population: 20,000) is the major town on Santa Antao, one of ten islands that make up the country of Cape Verde. Our bus tour of the island covered tropical rain forests near sea level and desolate, chilly volcanic mountaintops. The little towns combining Portuguese and African heritage and the amazing seascapes from roads carved into the sides of volcanic cliffs provided one of our best-ever cruise ship tour experiences. Three more sea days brought the Silver Spirit to the Canary Islands and then to Morocco where we chose a thirteen-hour tour to the ancient imperial city of Marrakech. With the largest public square in Africa (filled with snake charmers, monkey handlers, acrobats and story tellers) and the biggest traditional market (souk) in Morocco, this exotic city of close to a million inhabitants was well worth the visit. As we approached our final destination in Portugal, we asked a few fellow travelers about their cruise experience. Jack and DeeDee Mottet of Big Ben, California, were on their first-ever cruise and found the trip to be delightful. "We've been to all the talks and have met very interesting people," they said. 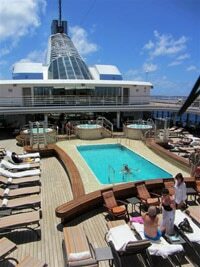 "We appreciate the cleanliness of the ship, the friendliness of the crew and the amazing food. One you get 10 out of 10, how much better can you get?"